Recently my friend and I were discussing a very important topic, what makes people believe in ghosts and visit haunted places? Although both of us were skeptical at first when all of a sudden my friend revealed that in his hometown there was a truly haunted ghost castle. He went on to tell me of the mysteries, hidden behind the walls of the Ghost Castle in Vasilyevka. The village of Vasilyevka is situated in the Ukrainian city of Zaporizhzhya, a city known for the mighty history of the Cossacks but the only place you can really visit is a tower built at the end of the 19th century. This tower, which is a watchtower, is famous for being cursed. The tower’s owner, Duke Vasiliy Popov, lived a fabulous lifestyle. Popov owned a magnificent mansion, had a beautiful wife, and a mountain of money. But all his wealth could not defend him from the inevitability of fate. One day the duke, accompanied by the young wife, went for a walk to enjoy the sunset from their roof. But his wife, rather carelessly, stepped on the hem of her dress and tumbled down the stairs. The stairway appeared to be her final journey, as no doctors could save her and bringing her back seemed an unattainable task. 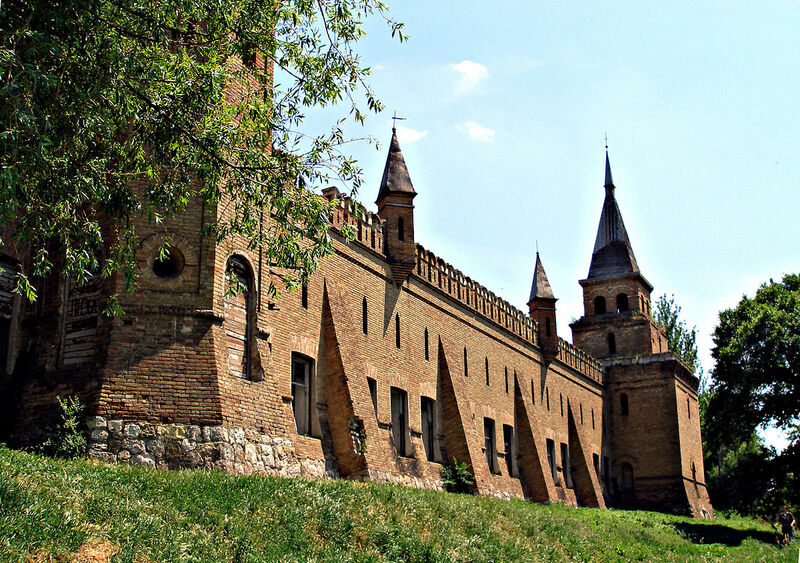 Today, local citizens of Zaporozhzhya believe that the ghost of Lady Elena dwells within the castle. Her death and subsequent haunting have caused stories and the belief that the very essence of the tower is accursed. Since her death, this lonely tower has remained the residence of the Lady Elena, and she does not allow anybody to visit her home. At least, that’s the locals think. As you can imagine, the residents of the village try to avoid this castle at all costs. However, those who have had enough courage to look inside, tell stories. The mansion itself is considered as a rare architectural structure of 19th century and Vasiliy Popov was recognized for it. Originally the castle had fifteen rooms each dedicated to a different nationality, such as Chinese, Indian, Turkish, etc, nowadays only the parade halls and warehouses are preserved. Apart from that, the visitors must observe the coach house, stable, chapel, and a couple of towers from afar and behind a fence. What is also interesting is that the architecture is a bit modernized but still decorated with neogothic elements. Certainly, such exterior decorations are not typical of that time. Tourist trips that visit Vasylievka seem to prompt a fair number of questions. Why did Duke Popov build his mansion not on Crimean land, which might be more fertile and fruitful, but instead in a little village? The answer is hidden in the depths of history but according to the old written sources, Vasiliy Popov was a loyal servant of Empress Catherine. It is also known Vasiliy Popov was the crucially important attorney of Duke Potemkin, Popov managed his international affairs and politics. As such the land near Zaporozhzhya had been given in exchange for the legal services, thus, it was appreciated. One more mystery that is will catch the attention of viewers, apart from the ghosts, is the unusual collection of disappeared dolls. It is long been believed that Popov brought from one of his trips fifteen mechanical dolls, one of which could brew coffee while the others would bow down before the guests. The local peasants were shocked and started to spread rumors about the connection of the dolls with magical forces. Nowadays we would know that these dolls were mechanical and that is the explanation for this phenomenon but back then… The Duke might have paid big money for these mechanical dolls. But the story, so mysterious, still persists to this day. Well, what else would have made dolls move if it had not been for the magic right?